Now that I’m thinking of doing DIY Audaxes it’s become essential to have a 100% reliable GPS system to record an accurate gpx trail over the 12 or so hours that a 200km ride takes me so I thought I would give the Wahoo Elemnt a try. Of late I’ve had major problems with my Etrex20 turning off randomly (bad battery connection?) the iPhone crashing, the Apple Watch also crashing mysteriously. So I’ve now bought a Wahoo Elemnt to see if that works any better! Important to note the Etrex & Elemnt stayed on the bike outside at the coffee stops whereas the iPhone came inside with me. One major disadvantage of all the above is that none can read the Apple Watch heart rate data although the Cyclemeter app can do it in a rather random fashion. The iPhone is the most disappointing fulfilling the “Jack of all trades – master of none” phase. For really serious uses where it would be awful to have a mangled gpx file after riding all day, it’s just too risky to totally rely on! However, as a touring GPS, it’s awesome for maps and ad hoc routes on the roadside plus booking accommodation on the move etc. 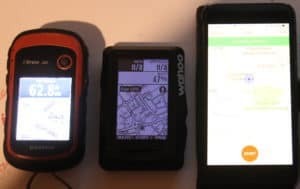 So for the moment, I will carry all 3 devices on my Audaxes 🙂 the Etrex is £100 cheaper than the Wahoo but has much less functionality although in some ways that can be an advantage as its less likely to crash.